Is your company growing with Microsoft Dynamics NAV? Do you sell products or services online? There’s now a special e-commerce solution that can be tailored to your company’s needs! Companies often need to quickly create effective and ergonomic websites for their business to succeed and grow. That’s why Microsoft Dynamics NAV includes a simple, complete management interface for all companies, regardless of their sector: B2B, B2C, personal services, content management, etc. The Microsoft Dynamics NAV online store is a simple way of managing your site according to your needs straight from your ERP, covering customer details, products, orders, etc. All information is synced and integrated into Microsoft Dynamics NAV in real time. This will save you and your employees a significant amount of time. The responsive design online store can be adapted to all devices: computers, mobiles, and tablets. Cap Vision will help you to create your online store and work with you to decide the essential features for your business. 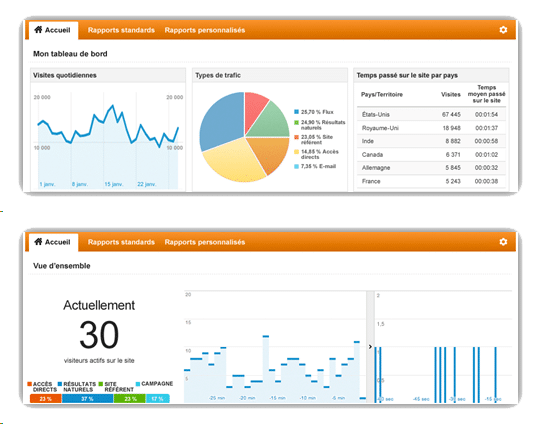 The tool uses up-to-date information from Google Analytics to inform you of how visitors are using your site, how they’re accessing the site, and how to get them to return. Explore your data in detail. Standard reports give an analysis of users’ interest in your site and how they interact with it.